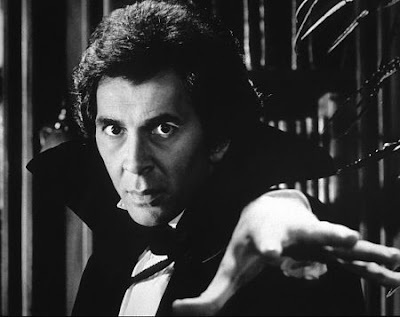 So this evening I watched the John (Saturday Night Fever) Badham directed "Dracula" featuring a surprisingly young Frank Langella as The Count. It's an oddly English centric version of the story. There's no Texans lurking about, Harker never travels to Romania, Harker himself is played by someone who looks like Howard Moon, and Donald Pleasance gets a lot of screen time. And they don't actually return to Transylvania to wrap things up. Its not a bad movie, but for reasons I can't piece together, they swapped names for the Lucy and Mina characters from the book, I believe. It seems this isn't the only place I've seen that, and I don't really get why this would be the case. As the last vampire movie I saw was "Twilight", it was nice to see a movie that actually acknowledged the horror/ blood drinking/ soul stealing aspect of the whole enterprise. And I really did like the red-eyed, bare-fanged look of the undead in this movie. I also spent a lot of time sorting and indexing comics. This is one of those projects that if you don't do it regularly, you're going to regret it later. Well, i waited until later. It's been between a year and 14 months since I did this up proper. Jamie is, I think, the only person who really gets what a ridiculously big task this really is. It's not something you knock out in an hour or two. And after 14 months... its quite a backlog of work. Keep in mind, the first time I did a proper indexing of my comics, it literally took several days and was how I spent my Holiday break from work. 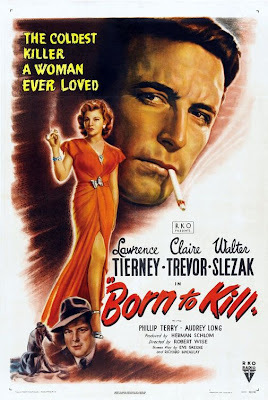 I also watched the crime-noir movie "Born to Kill". Which, sure enough, delivered some killing. It was part of a set Jason gave me for Christmas. He knows I like a good men-in-hats/ femme fatale flick, and this one delivered the goods. It's another example of the fact that no matter what Robert Wise directs, I pretty much like it. And there are a lot of movies on his filmography that I need to make sure raise to the top of my queue. The plot is tight, the cast fairly small. But Wise handles his cast well, and the story manages to remain suspenseful right up to the last frame or so. What the @#$% was wrong with the Victorians? And if you want something really disturbing, Calvin posted about something called "Memento Mori". Apparently some Victorians thought it would be a neat idea to prop up their recently deceased relatives for one last snapshot. It sounds as if they hadn't really sorted out appropriate use of a new technology. Like people who think its okay to talk on their cell phone in a movie or people who think its smart to let their digital party pictures show up on Flickr. But I gotta say, I was kind of thinking of heading for bed, and looking at a bunch of well-dressed-albeit-dead Victorians sort of set me back a little on my journey to Sleepytime Junction. Partially because the child mortality rate was still pretty high back then, and apparently it was an opportunity to get a picture of junior when he was willing to sit for a photo. (yes, lots of pics of dead kids). Anyway, please don't take a picture of me after I'm dead. Unless you can think of a way to make it really funny, of course. Jennifer and I watched the Rifftrax version of Twilight (Rifftrax, of course, being the MST3K folks) and we howled with laughter. I agree, give me soul stealing! Actually, I too saw Twilight via RiffTrax.